In my planning for this year, I promise I didn’t even think about trying to cross a few of the seven wonders of the world off my bucket list. Alas, somehow I found myself visiting two of them in the span of two weeks. After that, how do I even begin to be impressed by anything else in the world? Just kidding, that’s a problem I’ve never had. It doesn’t take much to get me excited. When I see something like Machu Picchu or the Taj Mahal, I just reach a whole new level. My thoughts usually go something like this, “OH MY GOSH. THIS IS SO COOL. THIS IS SO COOL. DID YOU SEE THAT??! WHAT ABOUT THAT?! AH LOOK OVER THERE TOO! THIS IS SO COOL. THIS IS SO COOL. THE COOLEST. SO COOL. I CAN’T BELIEVE I’M HERE. AHHH. AHHHH!!! SO COOL!!!!! !” Yes, in all caps. I promise it isn’t quite as annoying in my head as it is to read. On our way there, we stopped at the McDonald’s in this mall to get some lunch. 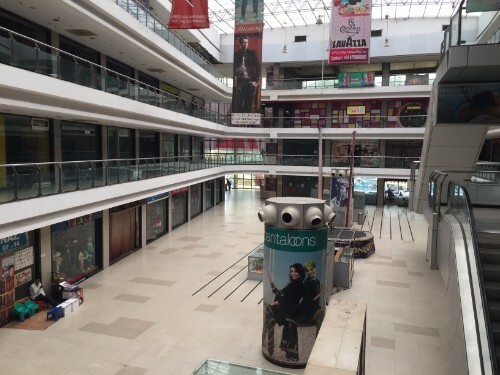 The rest of the mall was like the eerie set of a zombie apocalypse movie. I’m getting ahead of myself though, as I often do when I’m excited. 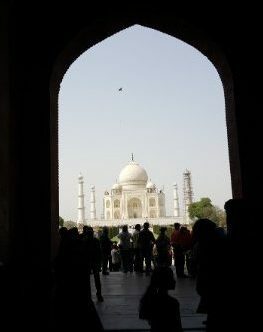 As you might have guessed, sightseeing day #3 was Taj Mahal Day. Aka Lara-loses-her-mind-with-excitement day. 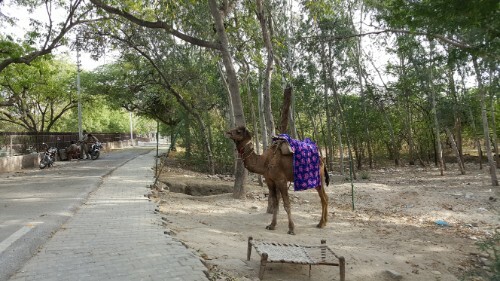 We left a little earlier than usual because it’s about a 3-hour ride to Agra, where the Taj Mahal is located, from Delhi. There are a few different ways you can get there, like tourist buses or the train, but we decided to hire a cab for the day. It was around $100, and it made the whole experience way low-stress. The driver picked us up, we stopped for lunch when we were hungry, he dropped us off right in front of our destinations, he kept the car nice and air-conditioned, and we got to go wherever we wanted, whenever we wanted, without having to worry about a group or schedule or finding our way. 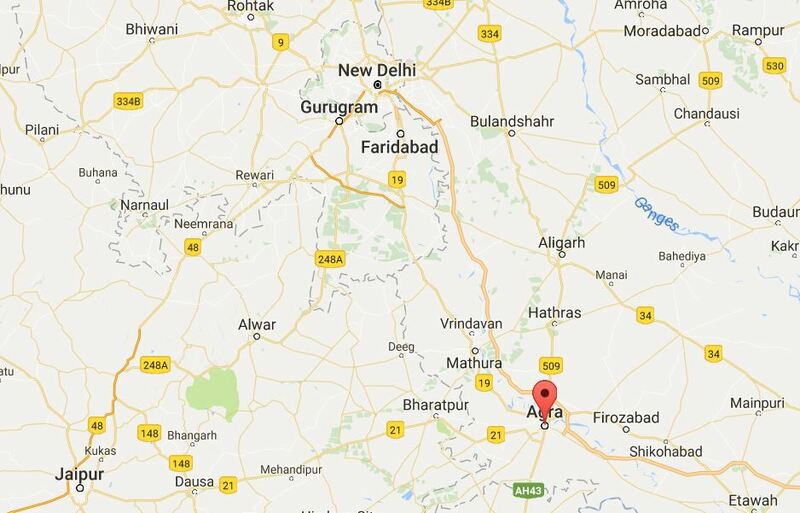 Here’s where Agra is in relation to Delhi. You can see Delhi up to the north. 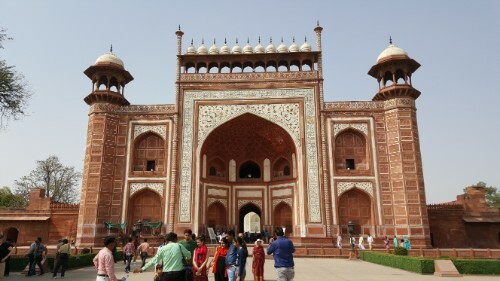 Our first stop after reaching Agra wasn’t the Taj Mahal, rather, it was Agra Fort (also called the Red fort of Agra). 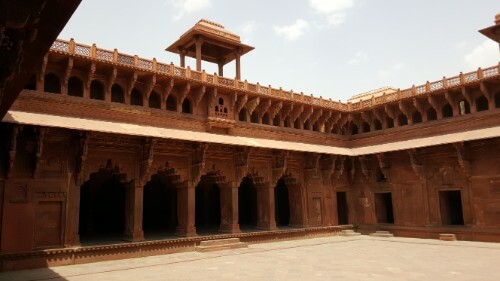 Like the Red Fort in Delhi, it’s mostly built from red sandstone. 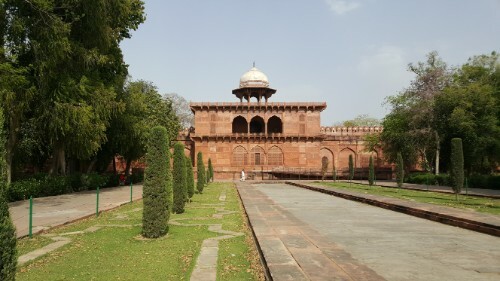 It has a long history, but it was built into its current form by the Mughal rulers after it was ruined in battle. 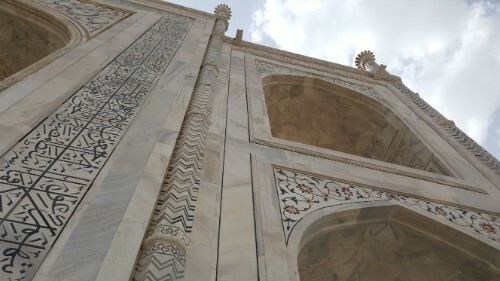 The construction was started by Emperor Akbar in the mid-1500s, and Emperor Shah Jahan (our buddy who built the Red Fort and Jama Masjid in Delhi, plus most famously, the Taj Mahal) replaced some of the sandstone buildings with white marble ones during his reign. 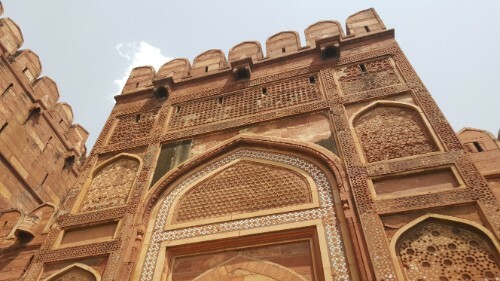 The fort is linked to the Taj Mahal because of some complicated Mughal politics that resulted in one of Shah Jahan’s sons putting him under house arrest in the fort where he could gaze upon his great monument from a distance. 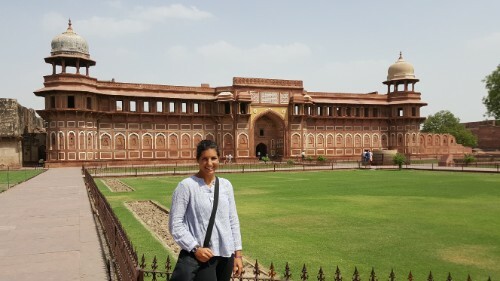 The Amar Singh Gate to enter the fort. Supposedly the second most beautiful entrance (imagine what the other one must be like to make this only second best! ), but this is the only one that tourists can use. The fort is another monstrosity. 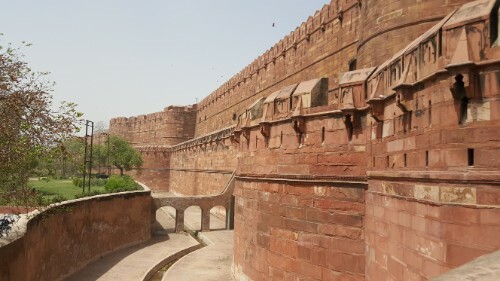 The walls stretch for around 1.5 miles and contain about 95 acres. At its height, there were over 500 buildings inside, many of which were destroyed by the British. 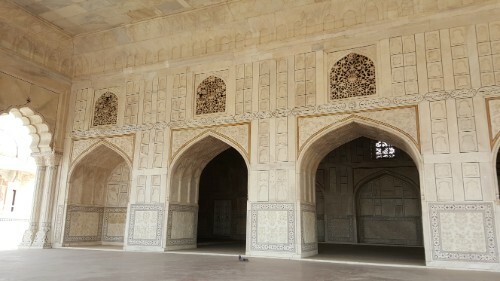 Luckily, some of the awesome buildings of Shah Jahan are among the 27 that survived. With so many buildings, you might think that the architecture would be more simple… and of course, you’d be wrong. 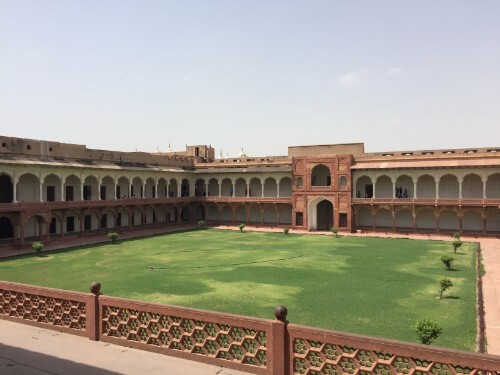 Based on their architecture, I’m not sure that the Mughals even knew the definition of simple. 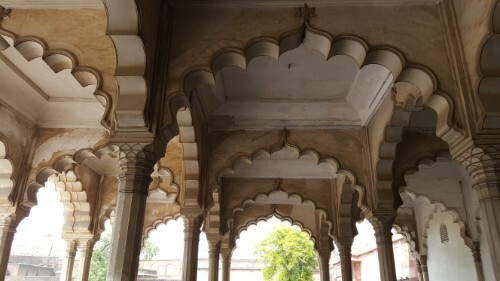 There’s intricate detailing everywhere, and I can’t even imagine what it looked like at its height. 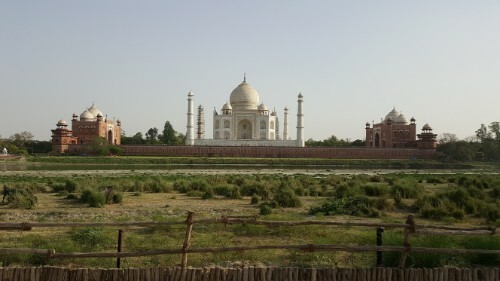 And then of course, in the distance, through the smog, I got my first glimpse of the Taj Mahal. Initial reaction: it looks small. Well duh… from there it’s about a mile and a half away. There’s a trick where, if you’re looking at it through a window, it looks like it’s getting bigger as you walk away because it fills up more and more of the window. While you’re doing it, you know in your head that it’s the same size, but still your eyes are fooled. 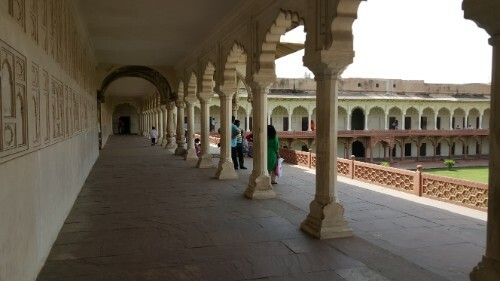 The balcony where Shah Jahan spent his last years. It’s kind of hard to feel bad for the guy with a jail cell like this. 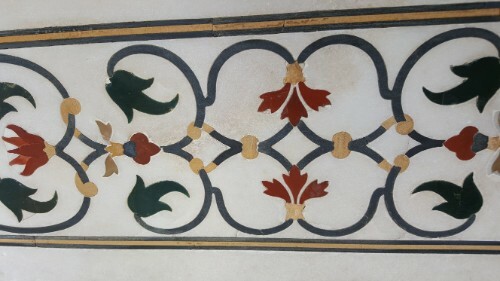 Just a little preview of the level of detailing Shah Jahan liked. 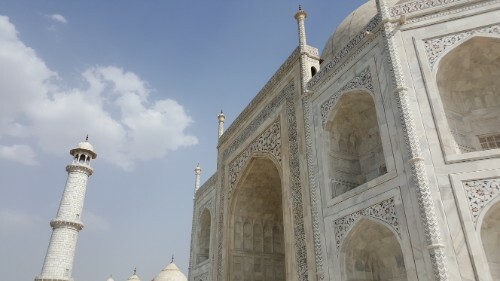 For those of you who aren’t up on your Taj Mahal facts, it’s a tomb. That’s crazy, right? All of that grandeur for a couple of bodies. Actually though, it was just intended to be used for one body, and besides being a tomb, it was a monument to love. 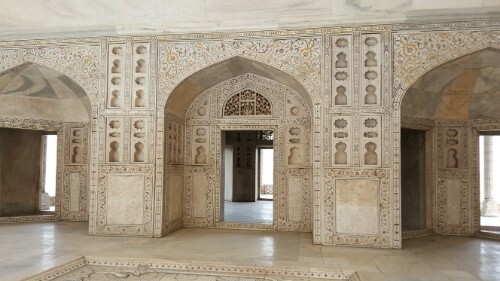 Shah Jahan built it for his favorite wife, Mumtaz Mahal. It is said that he fell in love with her at first sight, and from the time when he declared that he wished to marry her, it took 5 years to actually happen. By then, he had two other wives for political reasons, but she was his one love and the others were wives in title alone. 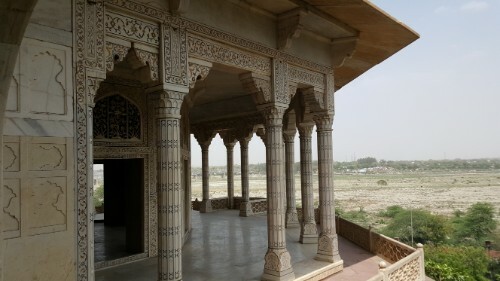 She accompanied him everywhere, including on military campaigns, and he gave her the title “Mumtaz Mahal” which means “Chosen One of the Palace”. 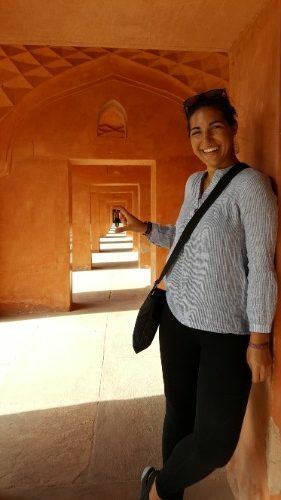 She died at 38 years old while giving birth to their 14th child. On her death bed, she asked him to never marry again (though he had married others while she was alive) and for a monument to their love. He agreed to both. After her death, he was filled with grief and went into secluded mourning for a full year. 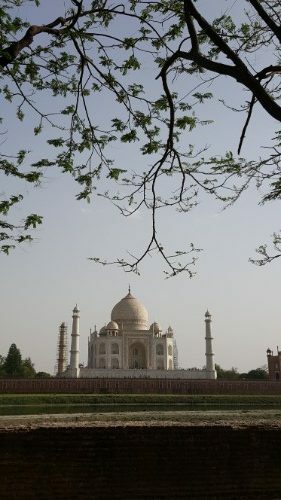 There are rumors that the original intent was to have two Taj Mahal-like structures, one on each side of the river, one in white for Mumtaz Mahal, and one in black for Shah Jahan. These rumors have mostly been disproved, but it’s fun to think about anyway. 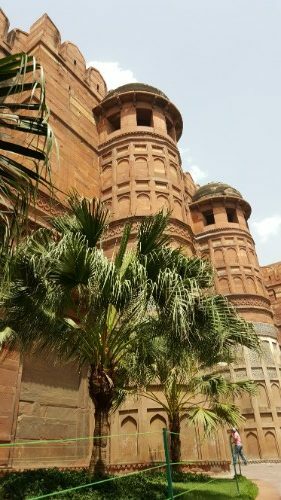 Just imagine if they were true and the “Black Taj” had really been built! 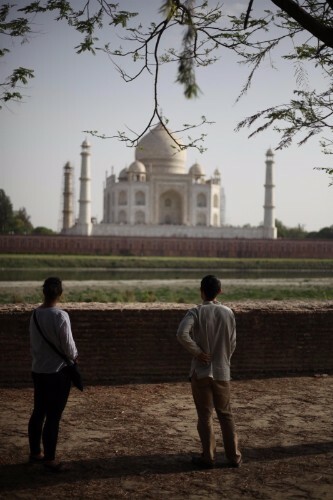 One Taj Mahal is already a lot to take in. 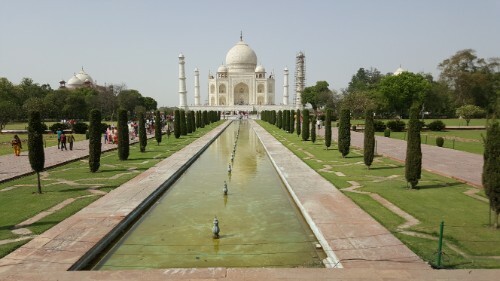 Today, Shah Jahan and Mumtaz Mahal are buried next to each other in the Taj Mahal. 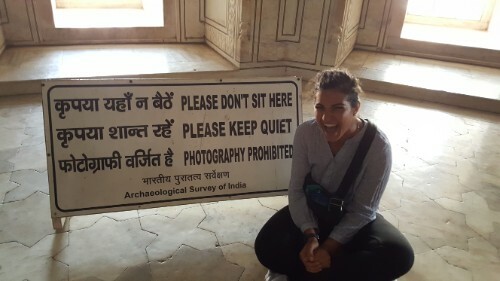 You think this is cool, and it totally is… but then you walk through, see the Taj Mahal, and immediately forget about it. 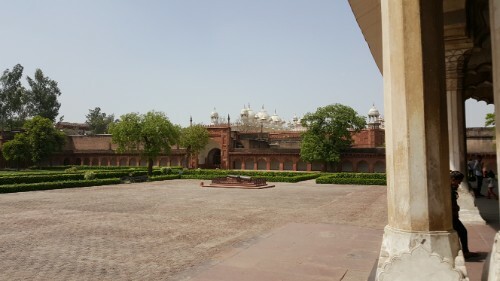 Construction was completed in 1648 after 22 years. It involved the best of the best, both in reference to materials and craftsmen. 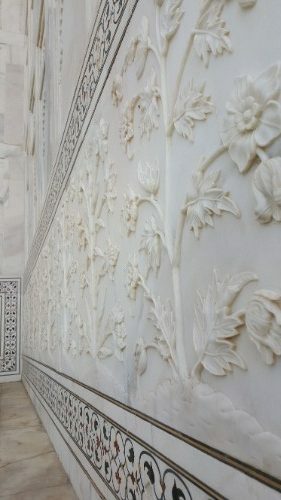 There were 37 master craftsmen with skills from calligraphy and inlaying to turret building and carving marble flowers, plus 20,000 other workers. 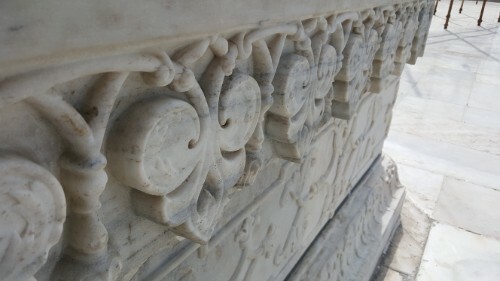 The marble is from Rajasthan, a neighboring Indian state, and the 28 types of precious and semi-precious stones used in the decoration came from all over Asia, from China to Afghanistan. Everything is symmetrical except for in the central chamber where Shah Jahan’s tomb was placed next to the centered tomb of his wife. 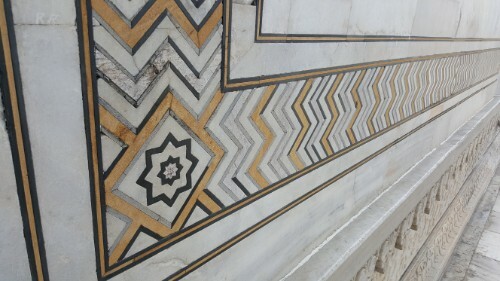 The bodies are actually located in a room beneath the main chamber and are marked with simple tombs to obey Muslim laws against elaborately decorated graves. 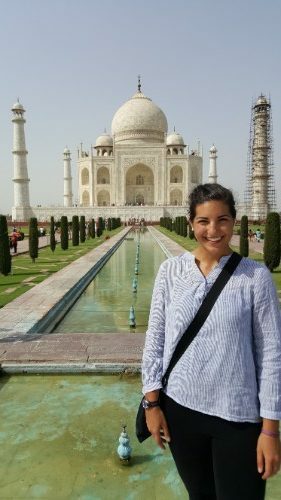 When you get your first glimpse of the Taj Mahal through the entryway, it doesn’t matter that you’ve seen a million pictures and know exactly what it’s going to look like. It’s still breathtaking. It still stops you in your tracks and makes your jaw drop. It still gives you those chills that you get when you’re looking at something so beautiful and so impossible to comprehend. It doesn’t even matter that there are a thousand other people there, all trying to get the perfect picture. It’s magnificent. It would take an eternity of close study to do fully appreciate the artistry that went into every single feature of the building. The details are insane. Attention was paid to every surface, and it’s not overdone or gaudy. It’s elegant. It’s not one of those situations where something looks great from afar, but up close it’s not impressive. No, from up close, it’s even more impressive. I could write on and on, trying to convey the splendor, but my words can’t do it justice. Not even close. Pictures aren’t enough either, but they’ll have to do. I wish I had pictures of the central chamber because that’s where the detailing reaches a whole new level, but you technically aren’t allowed to take pictures inside, and I’m not good at breaking rules. Full disclosure: this is probably the 15th picture I made Andrew and Rohan take because it had to be perfect and people kept getting in the background and my head looked smushed in some. 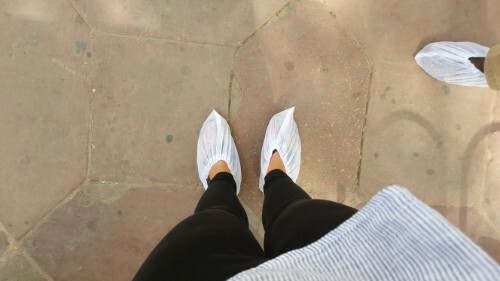 You get to (have to) wear these fun booties aka elf shoes when walking on the marble. Fun fact about the towers: they are all leaning slightly away from the mausoleum so that if they ever fall over for any reason, they’ll fall away from the tombs and won’t cause more damage on the way down. I know, I know… super tourist picture but it made me laugh so that’s all that matters. I know I said I’m a rule-follower, but these are like joke rules. After spending a good amount of time just sitting and soaking in the awesomeness, we left. I felt a little empty inside as we walked away, but luckily it wasn’t my last glimpse. 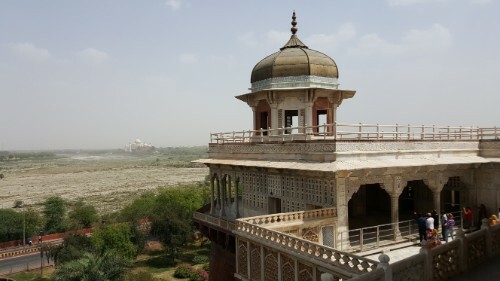 We headed across the river to the garden that sits opposite the Taj which is the speculated planned location of the Black Taj. There are foundations that make it seem like it could be true, but those are said to be just the remnants of some garden features. Like I said before, true or not, it’s fun to imagine. 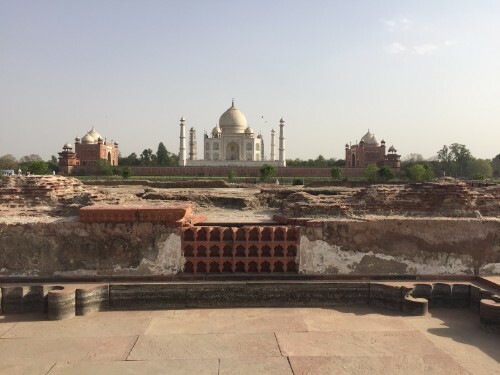 You can also get a great, tourist-free view of the actual Taj Mahal. We spent a little more time there, scoping out the best photo spot and dawdling so we didn’t have to say goodbye just yet, but eventually it couldn’t be pushed off any longer. We took our last looks, I tried to permanently etch it into my memory, and we headed back to the car for the long drive home. Candid… I know it looks a little posed, but really, it’s not. I can’t tell you how long we spent just staring.